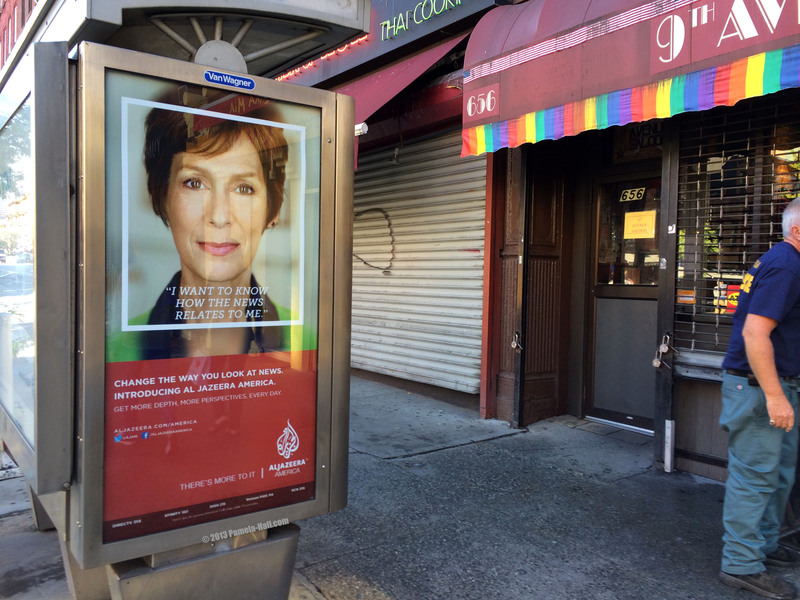 While walking to the Annual American Muslim Day Parade, I spotted another phone kiosk poster for al-Jazeera TV...outside a GAY bar.... and most passersby, no doubt, remain ignorant and unaware of the real purpose behind these ads. Taqiyya, an over-worked term, but what else is this? 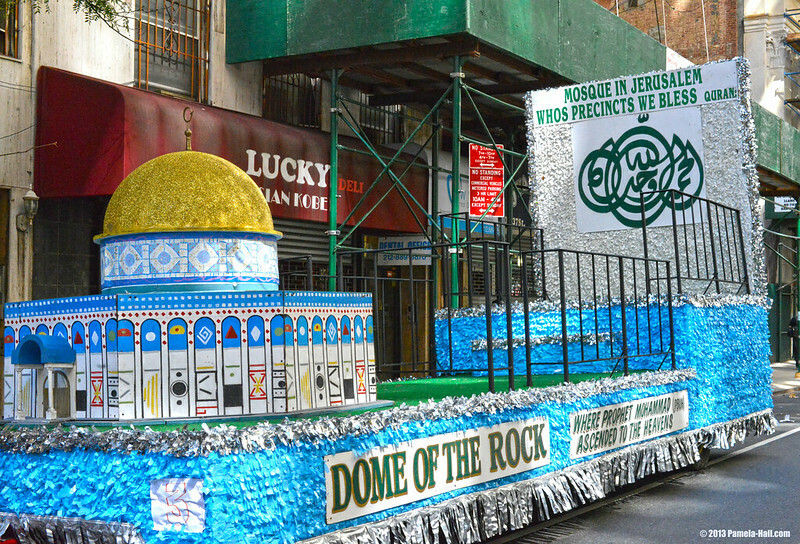 What else is the annual Muslim parade. 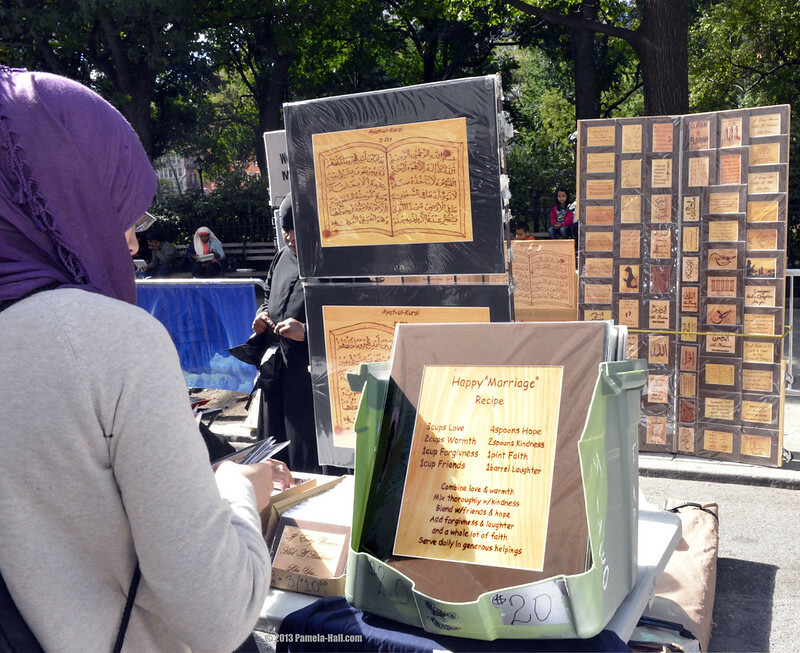 Taqiyya or Dawah: Americans should be concerned, alert and unafraid to challenge these deceptions. At the parade site, the routine was the same. 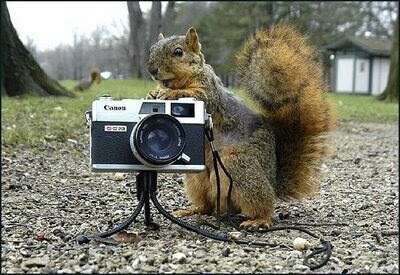 Set-up, phot-ops; prayers, photo-ops; parade, PHOTO-OPS and with the speakers and festival booths at Madison Square Park: Photo-Ops! 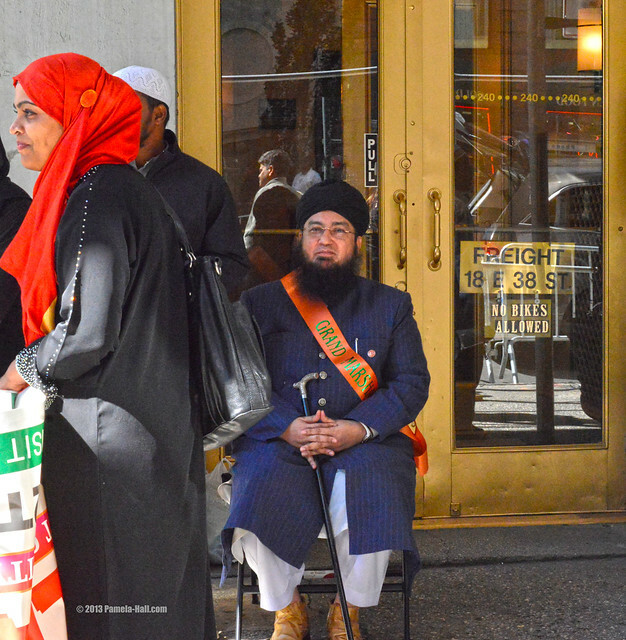 Muslims observed their Zohr Prayers on Madison Avenue BEFORE the parade down Madison Avenue. 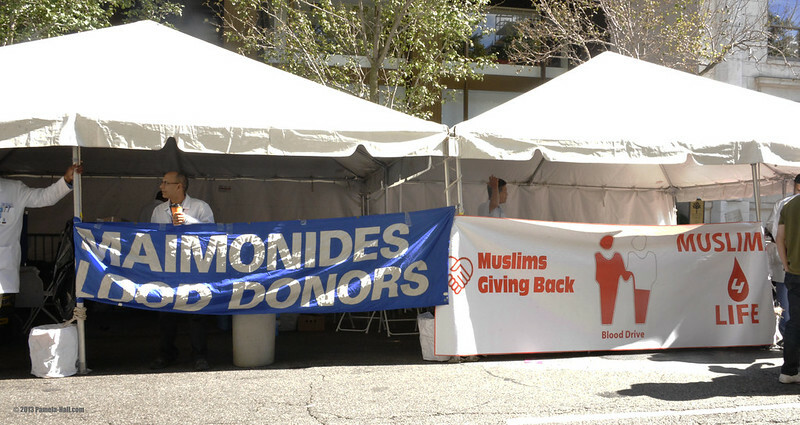 Prayers were led by Abdel Hafid Djamil, a Board member of the Hamas-loving Muslim American Society. 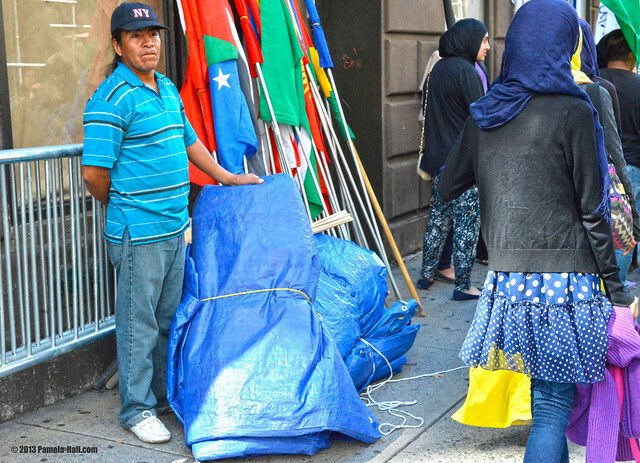 Also, before the prayers and waiting curbside, were the black (and white) flags of al-Qaeda and al-Shabaab, deadly jihadist terrorist groups. 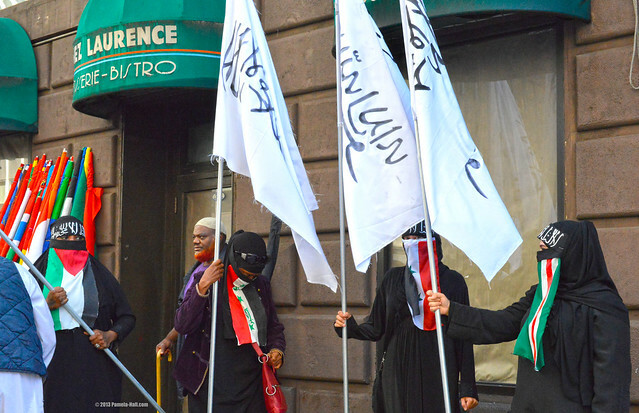 The flags were carried by niqabbed young women who soon marched down Madison Ave.
‘There is no god but God and Muhammad is his prophet." 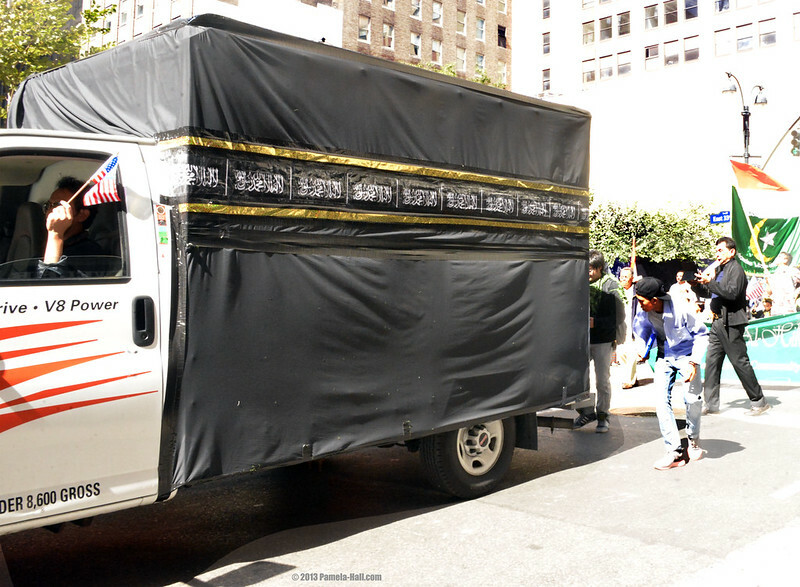 "Islam’s black flag with the shahada and sword inscription has been used over the centuries to intimidate their adversaries and create despair. It is generally used after a cleric has issued a death FATWA. The history and use of that flag... it was designed to create fear... it indicates a desire and intent to kill (the infidel) ." 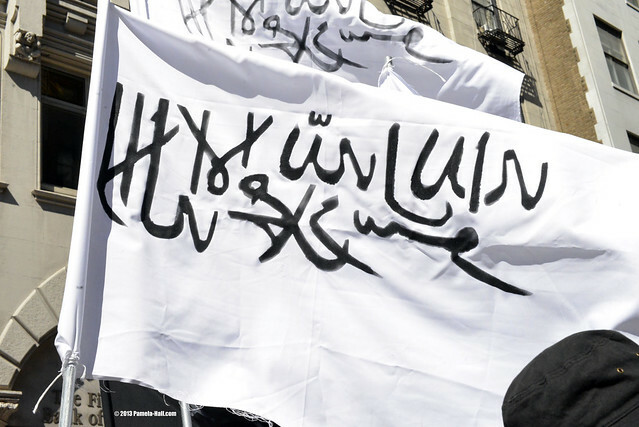 It is Islam’s most ancient banner, popularized by the Abbasid caliphs in the 800s. 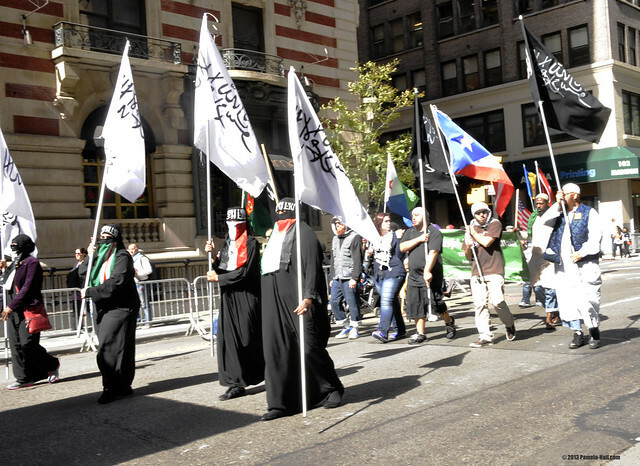 In other words, these protesters like al-Qaeda, are imitating Islam’s heritage, replete with jihad against the infidel. " 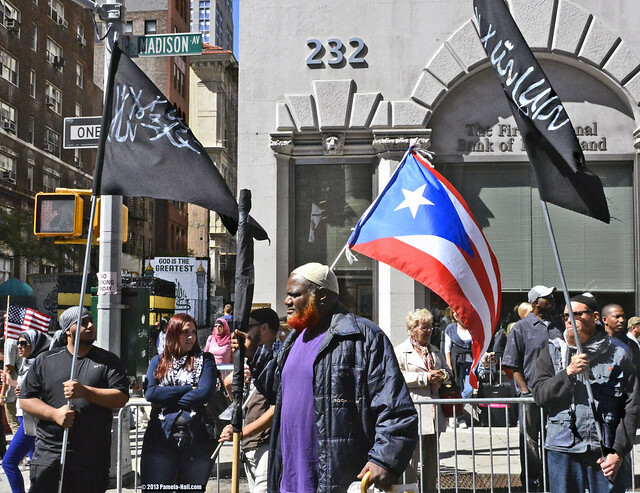 Preparing to march in solidarity with the other militants were "Fakestinian" kuffiyas, also carrying the black flag of al-qaeda and.... the flag of Puerto Rico. 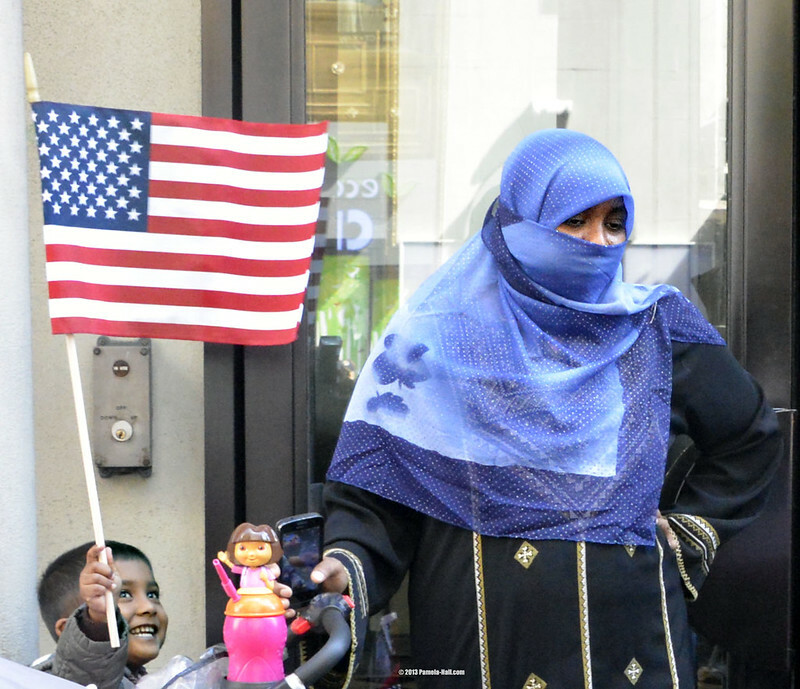 But, how is anyone able to comfortably believe a smiling family is only here in support of America. "When Samantha Laithwaite’s husband blew up a London subway, she played the grieving victim. Then she became a killer." Islam, Sharia...they are not allowed to support anything but ISLAM and the UMMA. 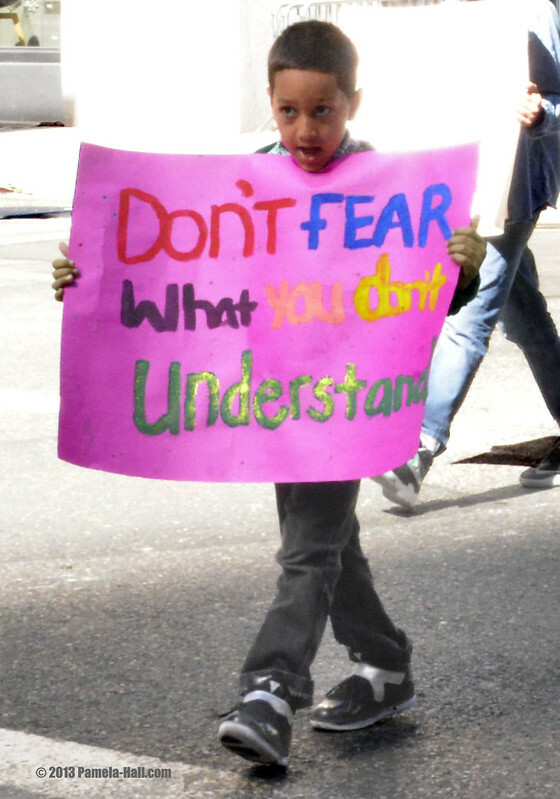 Especially when other parade participants were members of Charles Barron's, "Freedom" Party. 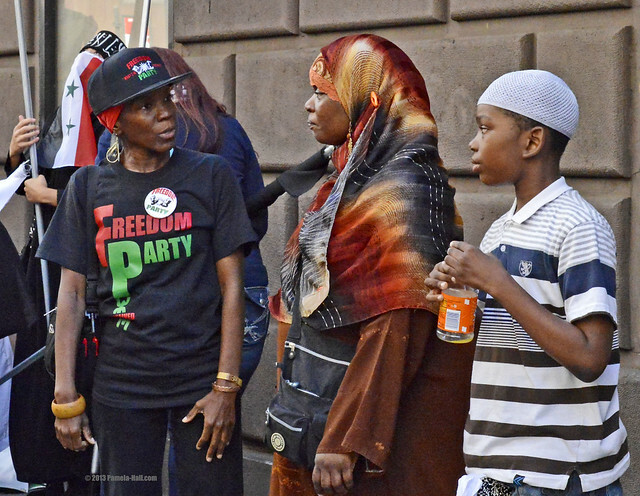 City Council member Barron is an infamous Marxist-loving 'former' Black Panther and these were rather intense parade participants. Which begs the question, "WHERE WAS Charles Barron?" And others ....like... Rabbi Feinberg. Debbie Almontaser. Lamis Deek. Linda Sarsour. Nihad Awad of CAIR. 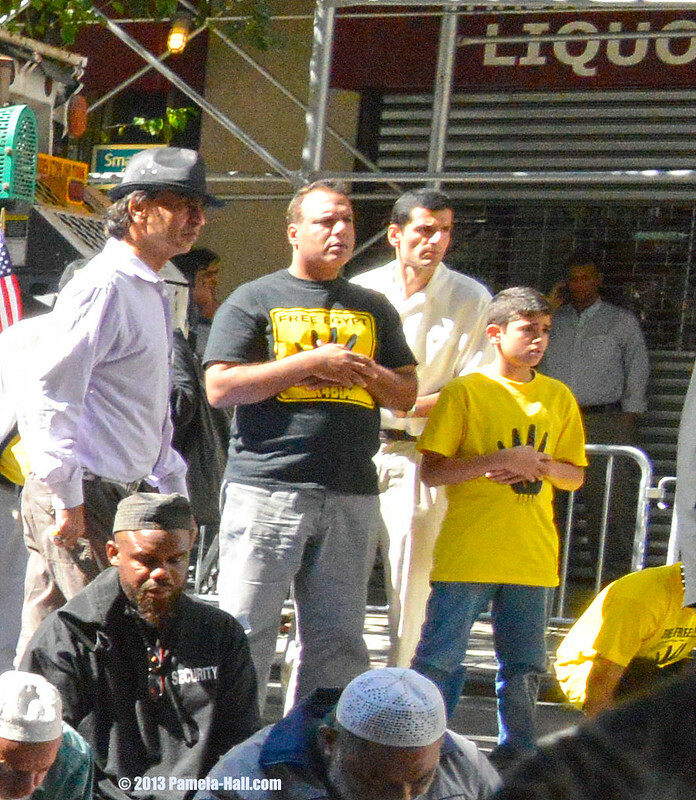 Cyrus McGoldrick, once a youth leader of NY-CAIR. 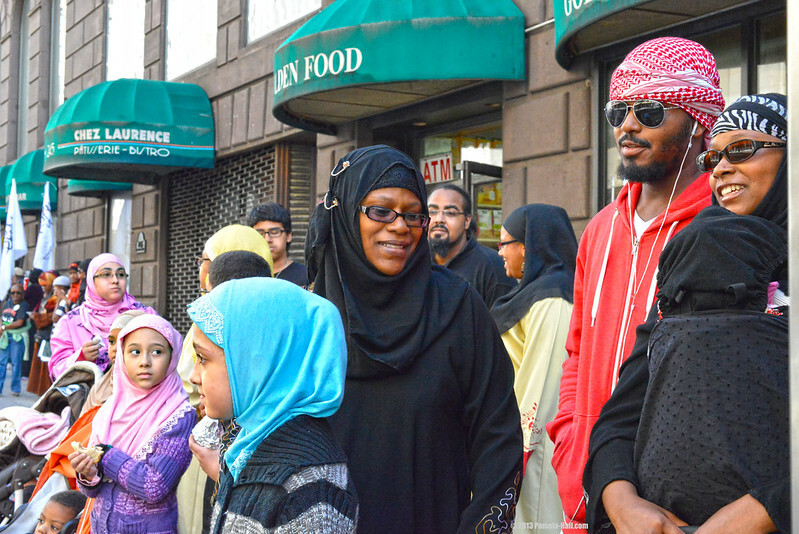 NO NYC Council member, Robert Jackson, a 'revert' to Islam. Jackson once proclaimed Harlem to be the Mecca of NYC. 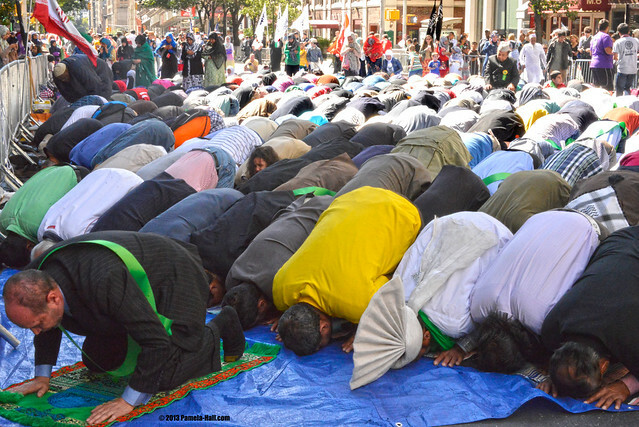 WHERE are the hard-core Marxist agitators who help co-ordinate so many Muslim protests? No Andy Pollack. Sarah Flounders of IAC. Caleb Maupin. Bill Doares. 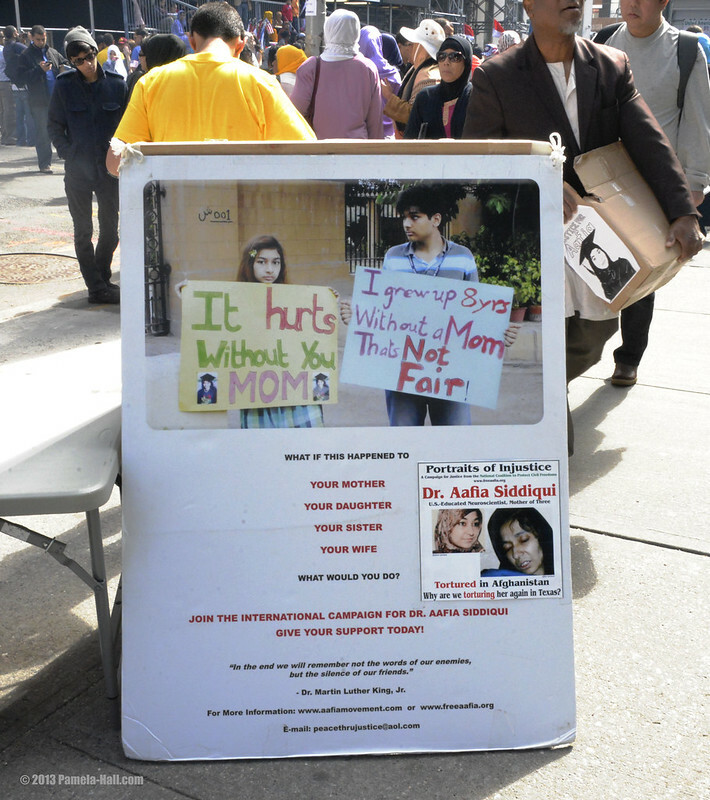 Donna Nevel and all those "Not in My Name Jews" and the "oh-so-cute" protesting "Grannies". Saw NONE of them. So many familiar faces missing. 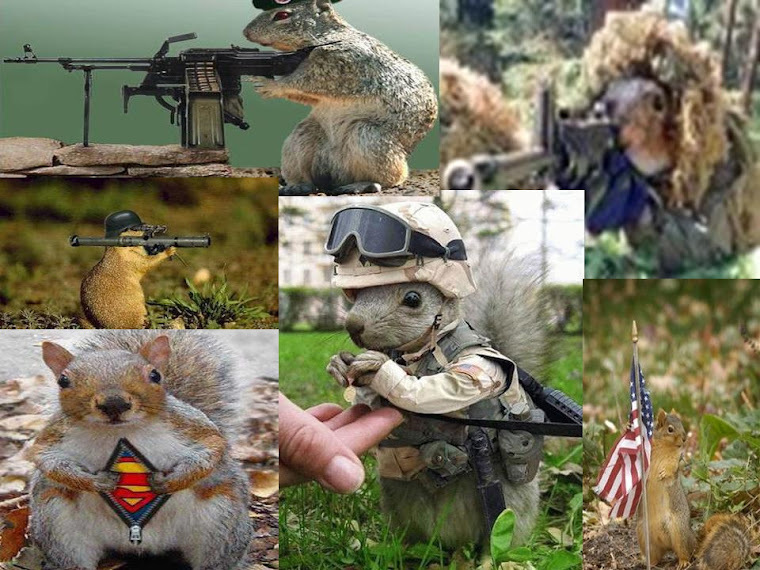 Is there possibly some dissension amongst the ranks? 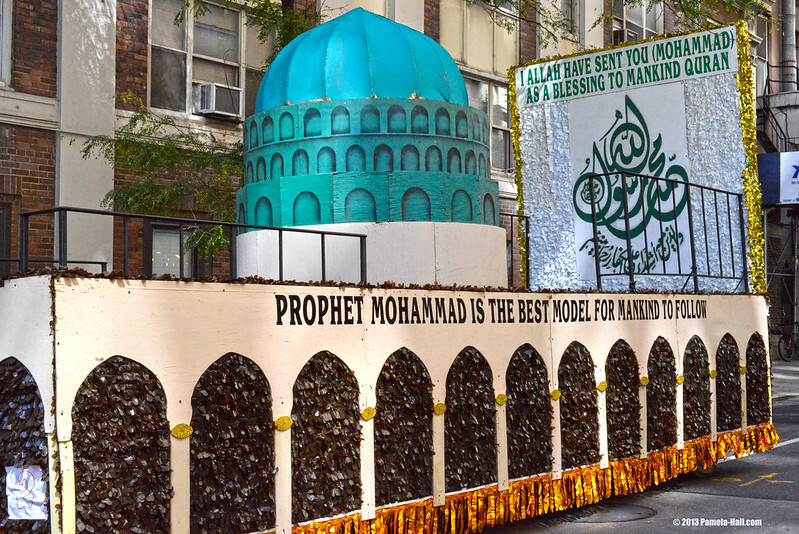 The Grand Marshall has studied Ifta (Issuing Islamic Legal Verdicts) under the highest ranking scholars of our time and has been issuing Fatwa for resolving the problems of the Muslims since the past 20 years and answered more than 25,000 questions. 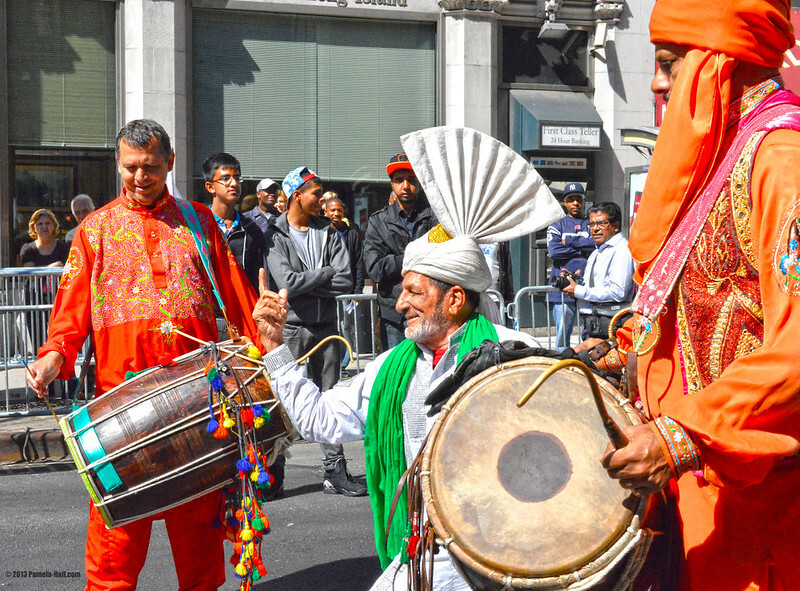 Ignoring the happy families and many children momentarily, and taking a good hard look at the militants in the parade, since there are no banners or signs enumerating Islam's contribution, perhaps....the Militants... ARE Islam's contribution to HUMAN Civilization! 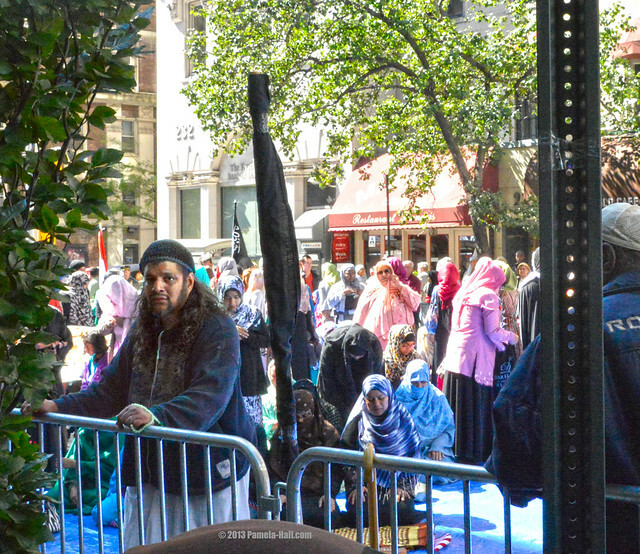 As they walked down Madison Avenue chanting takbirs, allahuh akbars and "WE ARE MUSLIMS, MIGHTY, MIGHTY MUSLIMS", is this REALLY just a "friendly" Parade or are there deeper intentions that America, at our own peril, has chosen to ignore? 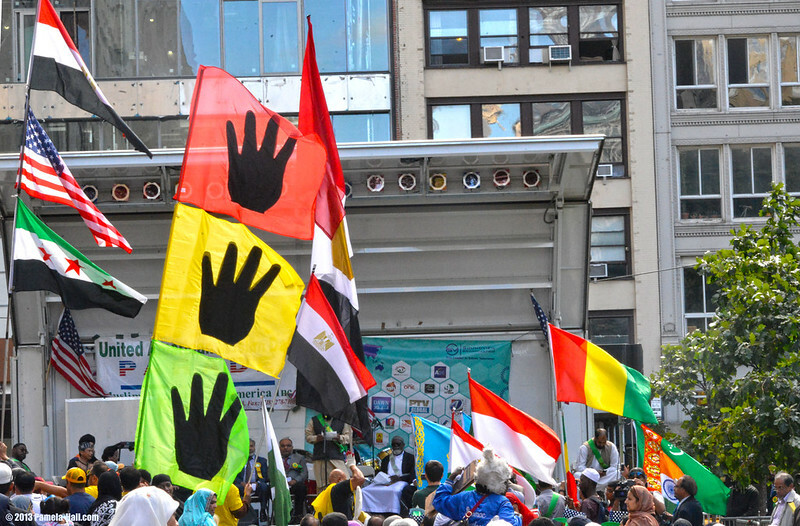 The words on these flags are supposed to be the shahada, the muslim declaration of 'faith' in 'allah'. More BEFORE the parade as we were treated to Dancing and DRUMS. One very odd fellow (not in costume) was dancing, even though he wasn't meant to do so. The weird fellow after the prayers. Earlier he took the opportunity to walk closely with me, telling me (with a garbled, flapping tongue and dirty teeth) "allah" was THE god." "Uh....yeah....", I replied, "For YOU, maybe, not for me!" (1) There is no deity but God. (2) There is no God but Allah. VIDEO PART 3 - PRAYERS . 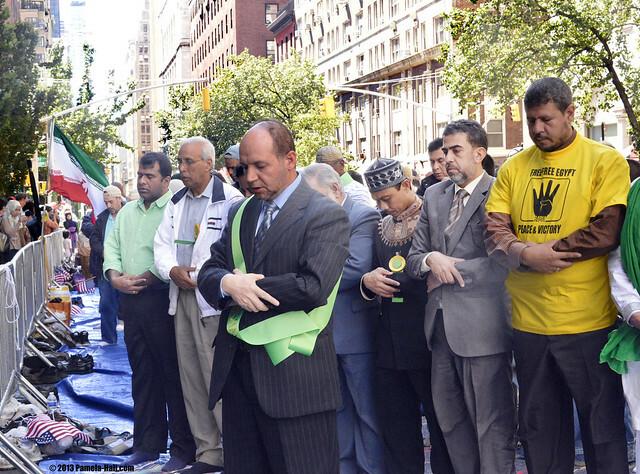 The prayers were led by a 'moderate', supposedly pro-American Muslim, Abdel Hafid Djamil, a Board member of the terrorist-supporting Muslim American Society. MAS leader, Mahdi Bray, proudly declared in Washington, DC (2000) that they, MAS, support terrorist groups like Hamas. 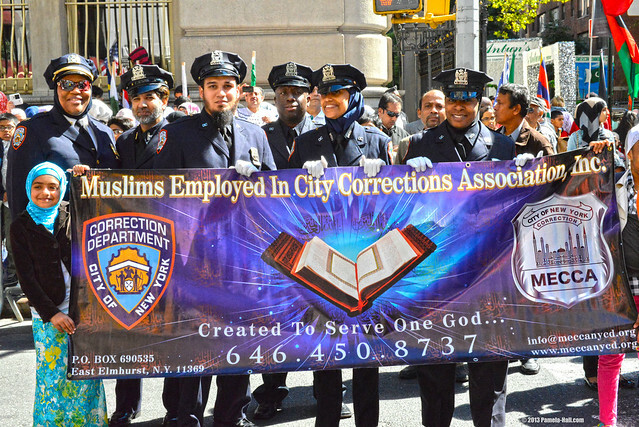 Yet, the NYPD Police Department Band marches in this parade every year and Police Commissioner Raymond Kelly was on-site this year for photo-ops giving credibility to the delusion that these groups like MAS and CAIR are peaceful and pro-America. 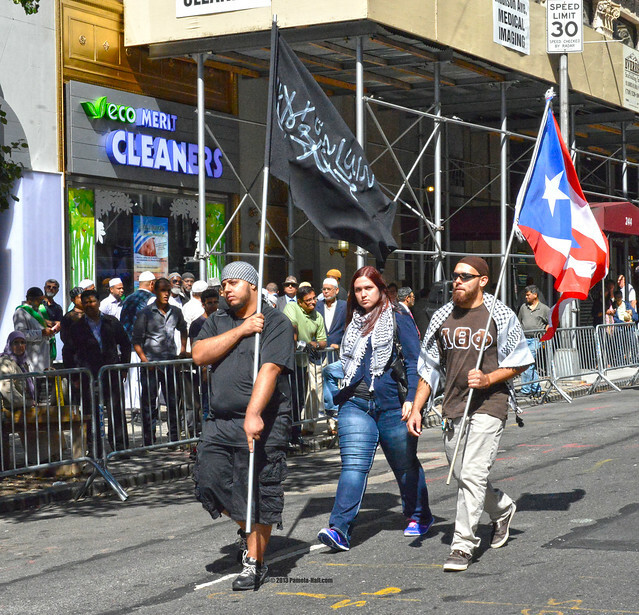 Abdel Hafid Djamil of MAS is a man who railed against Kelley and the NYPD Police Department in 2012 with claims of 'racism'. 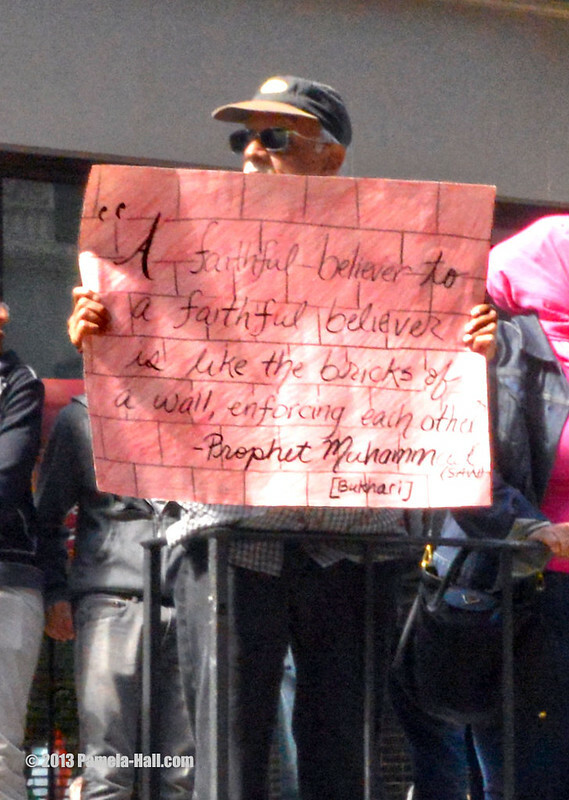 Djamil also led the fight on Staten Island to build a mosque on Catholic Church property. 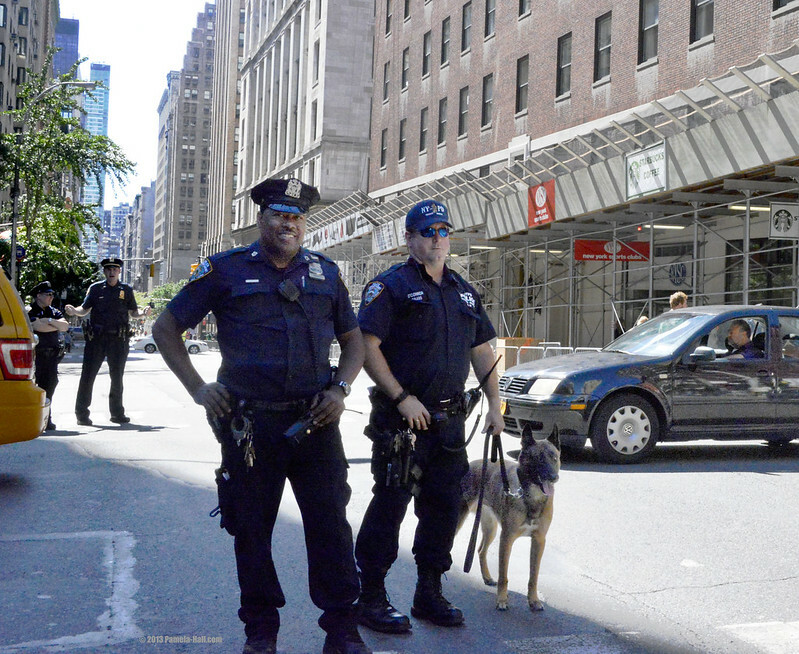 "The training of the 500 officers ... were required to watch a prejudicial, inaccurate and vile video starring the police commissioner (that requires) the establishment of community control of the NYPD, to over-see the conduct of the NYPD. " 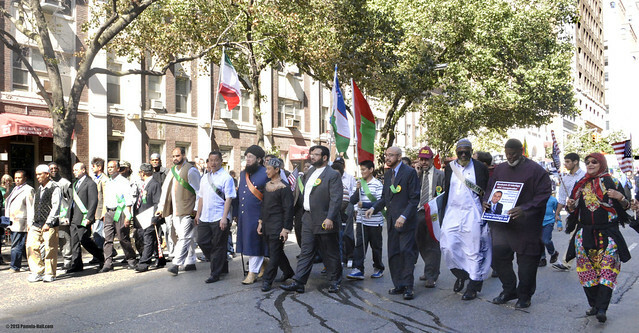 One of their chants was,"Stop the Killing, Stop the Genocide" but I didn't see any Coptic Christians or Jews in the crowd, so whose genocide were they referring to? 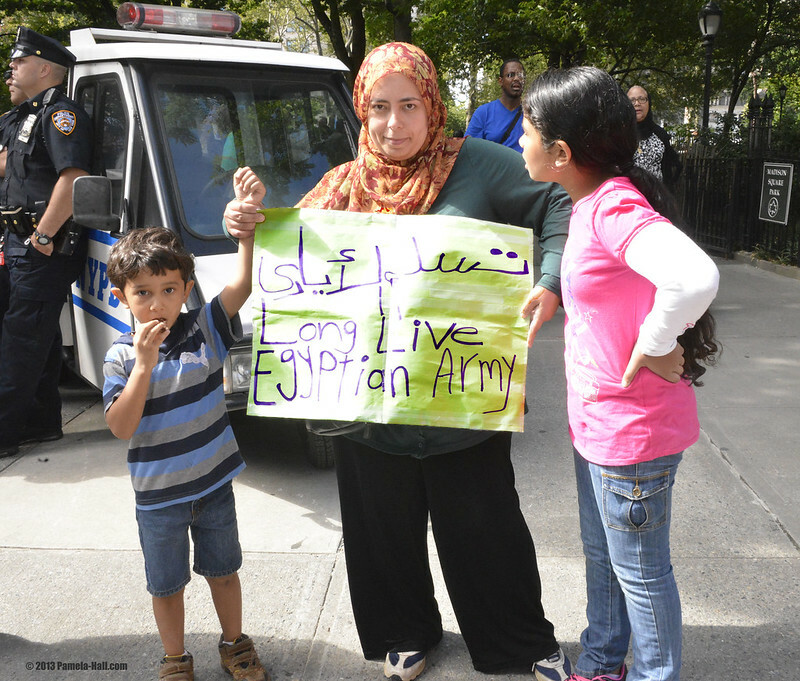 One hijabbed woman, all alone, was supporting the Military Defense of Egypt from the Muslim Brother Islamists. The parade started (as always) with the Police Marching Band playing "This is My Country"
There were many more niqabs than in previous years but, one was a bit bizarre even for this parade. 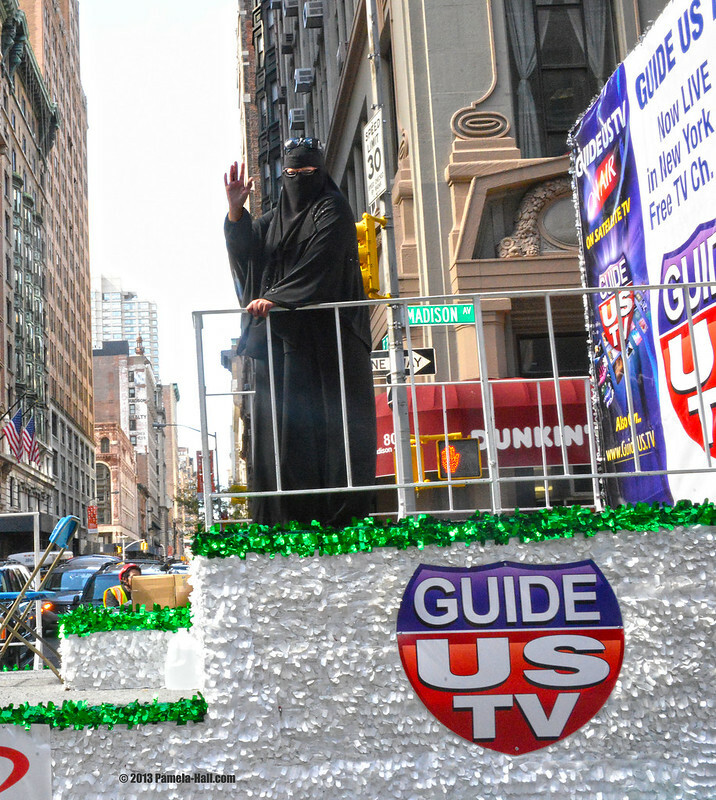 A woman (I suppose it was a woman) waving from the TV float in niqab! Continuing to look for the parade's elusive theme. Perhaps THEY thought this one to be so obvious, right under our "collective noses". Perhaps, the NIQAB IS ANOTHER of ISLAM'S CONTRIBUTIONS to HUMAN CIVILIZATION! Maybe that's why so many young girls (and women) were wearing niqabs this year? OR, should we be asking, "Are they REALLY okay with this? In America?" Is this really by choice? To hide behind these hoods? 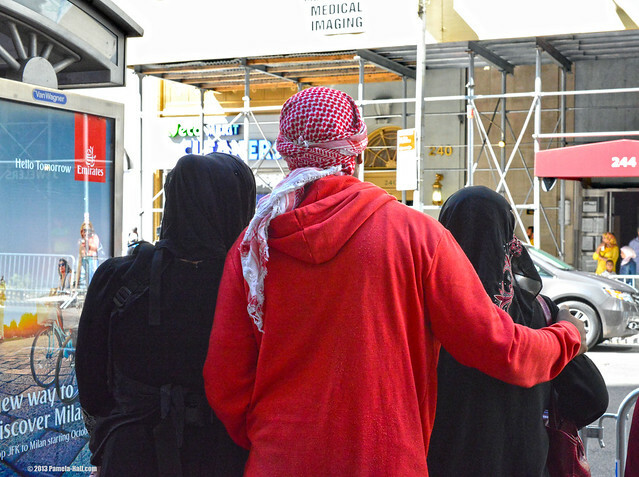 The niqab (or 'veil') and burkha, and to a lesser extent the hijab, are utterly symbolic items of dress. Despite what people think, even in the Arab world -- as well as in Iran -- the burkha and niqab didn't start being widely (if at all) worn until the late 1970s. In the UK itself, it is a very recent phenomenon. 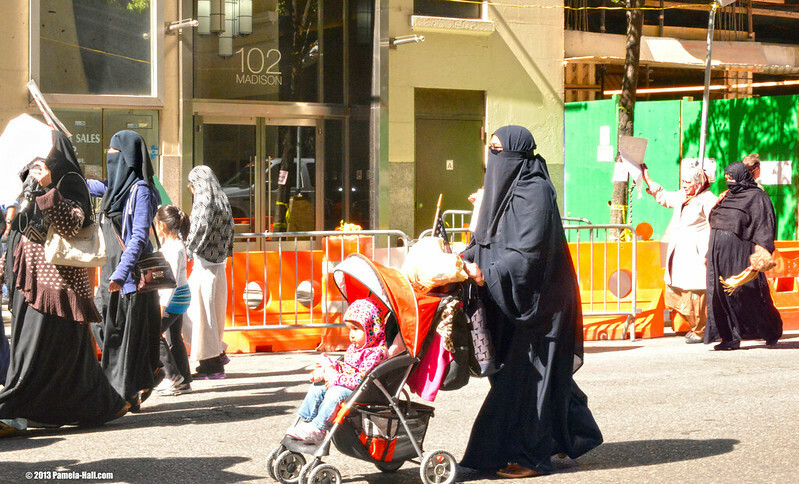 The burkha and niqab only began to be worn in the late 1990s or even in the 2000s (in many cases later than that). 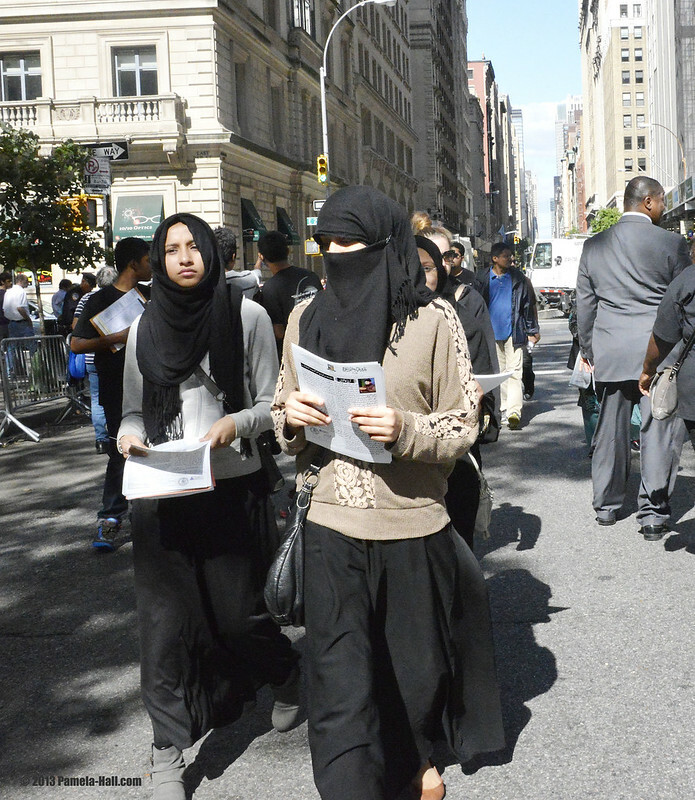 The niqab is a symbol of Islamism/fundamentalist Islam and of self-conscious difference. 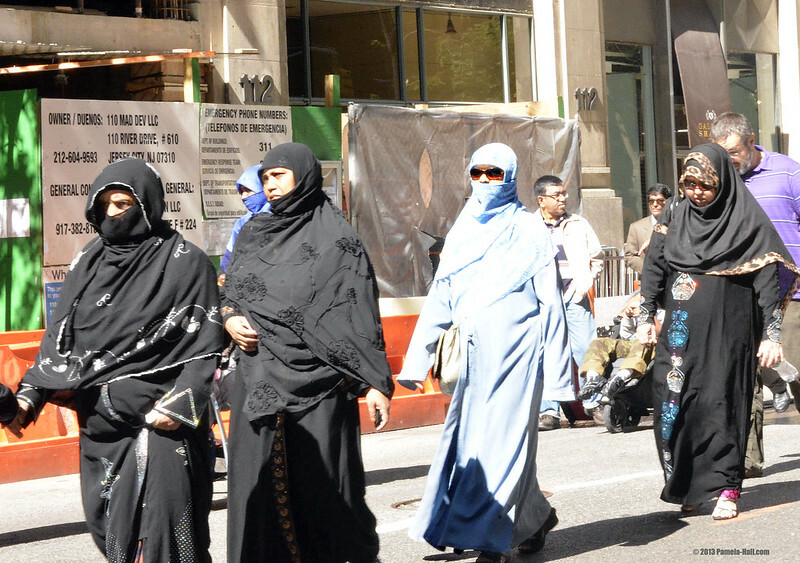 It is a symbol of the Muslim woman's complete separation from non-Muslim society. It is a political and religious statement. 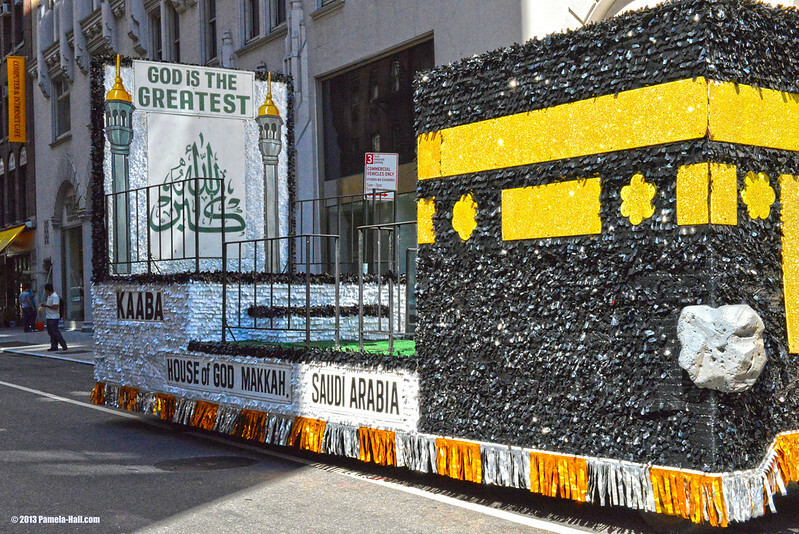 Think we could have a parade in NYC (or anywhere) shouting, "We are ALL Christians, Mighty. 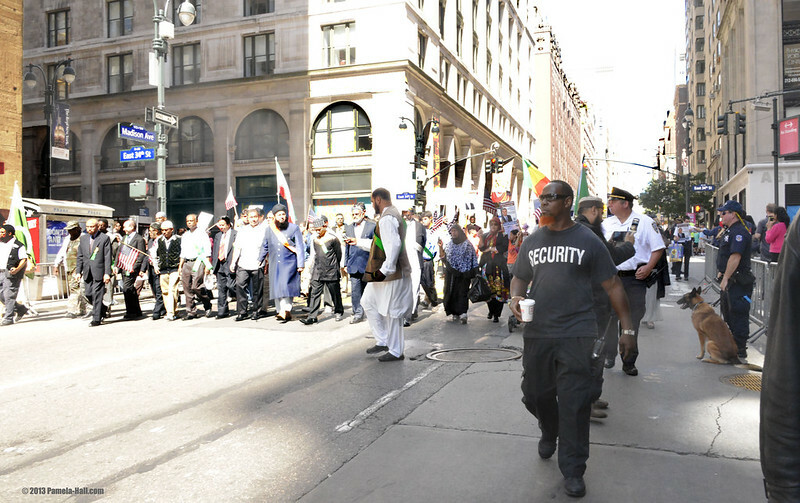 Mighty Christians" as we marched down an avenue. Shouting prayers and declarations like, "Jesus Christ is King" "Our Savior"... or whatever.... and make a grand showing of how many of us work in different government positions. Not very likely. The Muslim Community needn't 'worry'. We'd be denied or discouraged by the authorities from mimicking their parade. Period. Things have changed in America and NOT for the better. 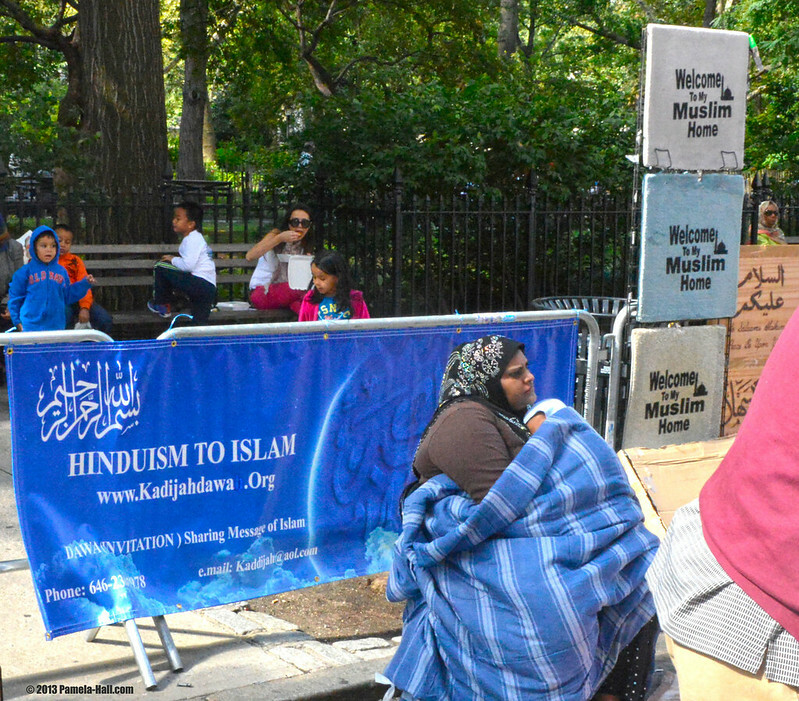 At the end of the parade, a few more dawah pics from Madison Square Park. 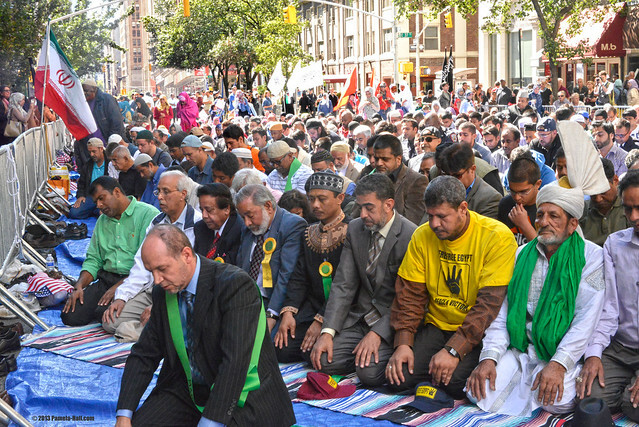 Perhaps the devastating Islamic JIHADIST attacks happening globally were played up to 'someone' claiming the MUSLIM community would be in DANGER... from... the Jihadis supporters who just happened to be marching down Madison Avenue. Really? Did our police really believe there was an increased 'threat'? 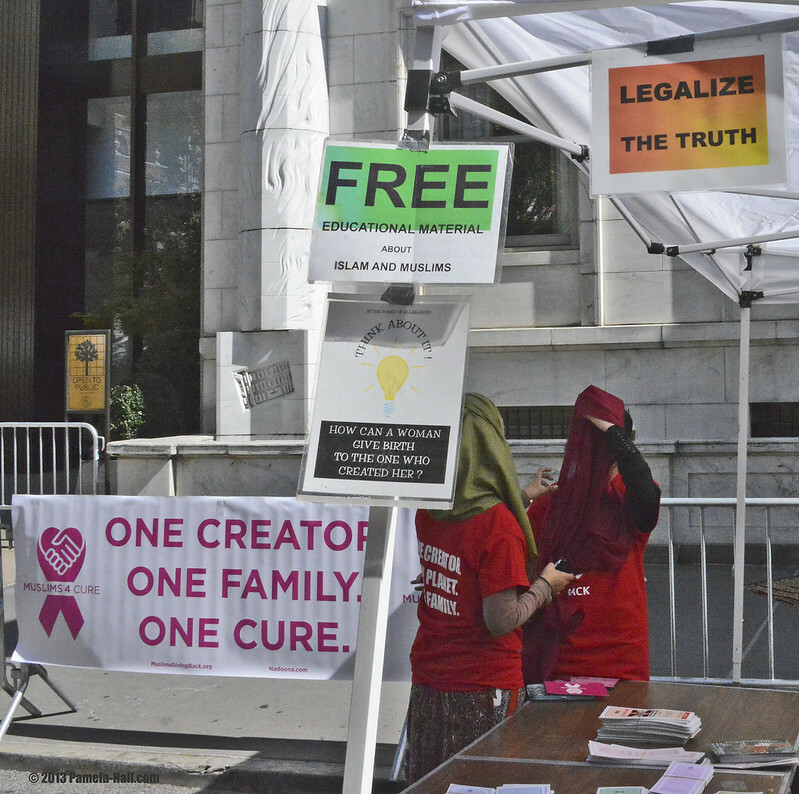 AND 10 educational handouts (from the parade and after) some of which are clearly offensive to Christians (but we're not ALLOWED to say so).